Galleri Pictura invites you to their new film screening on Monday 19/2 at 17:30, room C126. 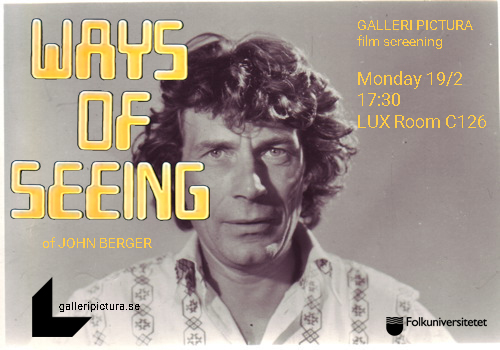 ‘Ways of Seeing’ is a 1972 television series consisting of 30 minute long episodes created chiefly by writer John Berger. It was broadcasted on BBC Two in January 1972 and it questioned the way we look at images in Western society. It is a classic among visual culture and art history and we thought it would be fun to watch and discuss it together. It will also be a great introduction for our next event ‘Föreläsning med Historielabbet’ on 27/2.